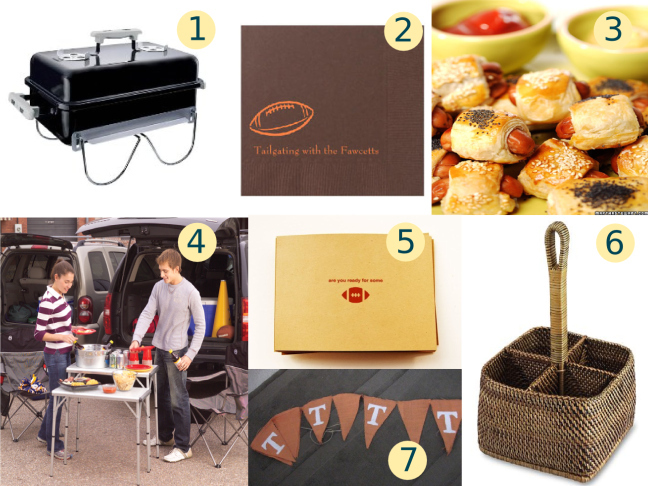 Football season is here, and that means one thing: Tailgating! Here are some ideas to get you in the mood! Fall and football go hand-in-hand, and the season's cool weekend weather is perfect for outside revelry! Whether you're headed to a high school, college, or pro game, packing up the back of the car for an afternoon of fun is easy. Start by sending out festive invites to the gang and buy or make a party garland for your team. Prepare plenty of finger foods, and bring along a portable grill to cook up the rest. Lightweight folding tables are easy to transport and are a must-have to hold food and beverages, and a utensil caddy keeps plastic forks and knives neat and organized. Personalized napkins add to the fun, and make cleanup easy before heading into the stadium. Go Team!